The map to the right depicts the geographic regions of eclipse visibility. Click on the map to enlarge it. For an explanation of the features appearing in the map, see Key to Solar Eclipse Maps. The instant of greatest eclipse takes place on 2017 Aug 21 at 18:26:40 TD (18:25:32 UT1). This is 3.2 days after the Moon reaches perigee. During the eclipse, the Sun is in the constellation Leo. The synodic month in which the eclipse takes place has a Brown Lunation Number of 1171. The eclipse belongs to Saros 145 and is number 22 of 77 eclipses in the series. All eclipses in this series occur at the Moons ascending node. The Moon moves southward with respect to the node with each succeeding eclipse in the series and gamma decreases. The total solar eclipse of 2017 Aug 21 is preceded two weeks earlier by a partial lunar eclipse on 2017 Aug 07. The eclipse predictions are given in both Terrestrial Dynamical Time (TD) and Universal Time (UT1). The parameter ΔT is used to convert between these two times (i.e., UT1 = TD - ΔT). ΔT has a value of 68.5 seconds for this eclipse. The following links provide maps and data for the eclipse. The tables below contain detailed predictions and additional information on the Total Solar Eclipse of 2017 Aug 21 . Eq. Hor. Parallax 08.7" 0°58'55.7"
Predictions for the Total Solar Eclipse of 2017 Aug 21 were generated using the JPL DE406 solar and lunar ephemerides. The lunar coordinates were calculated with respect to the Moon's Center of Mass. The predictions are given in both Terrestrial Dynamical Time (TD) and Universal Time (UT1). The parameter ΔT is used to convert between these two times (i.e., UT1 = TD - ΔT). ΔT has a value of 68.5 seconds for this eclipse. 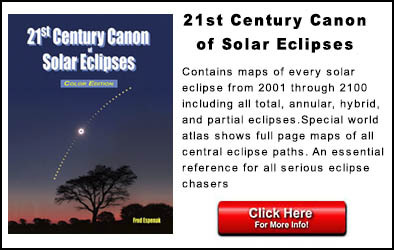 Some of the content on this website is based on the book Thousand Year Canon of Solar Eclipses 1501 to 2500. All eclipse calculations are by Fred Espenak, and he assumes full responsibility for their accuracy. 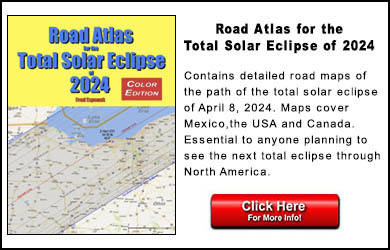 "Eclipse Predictions by Fred Espenak, www.EclipseWise.com"
The use of diagrams and maps is permitted provided that they are NOT altered (except for re-sizing) and the embedded credit line is NOT removed or covered.